Were you lucky enough to get a new telescope for Christmas? If so, I'm guessing that if you're reading this then you may be getting annoyed that you can't see anything through it or you may still have to unwrap the thing, daunted by the astronomical learning curve that lies ahead. Using a telescope for the first time isn't always as easy as it sounds, but fear not! This Discovery News "Telescope Primer" will get you started so you can not only enjoy 'first light,' but also get your new scope ready for searching out countless wonders in the night sky. First things first, what kind of telescope is it? Take a look down the open end and you will either see 1) a lens, 2) a lens and a mirror or, 3) just a mirror. If it's either of the first two then you can skip the next bit. If you have a telescope with just mirrors (3) then you have a reflecting telescope and you will need to check its collimation! Oh no! I hear you cry. But don't panic! It's not as scary as it sounds; collimation just means you need to check the mirrors to see if they are all aligned properly. If they are not then you will not get the best image. Rough collimation can be done during the day, but more accurate alignment needs to be done with a star. Details of performing collimation are quite lengthy, but I have a good description on my website so head over there to check yours. 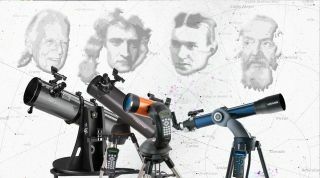 Assuming you have now collimated your reflecting telescope, then the rest is now the same whatever telescope you have. The next thing you need to do is get the focus in roughly the right place. If you fail to do this, it becomes a "chicken and egg" situation: you can't focus on a star at night because you cannot find one, and you cannot find one because you are out of focus! Take your telescope out during the day and point it at a tree or chimney a long way off in the distance; the further the better. Now place a low-power eyepiece in the telescope and adjust the focus until it is nice and sharp. Re-center the object in the eyepiece and now take a look through the finder telescope (the small telescope on the side). You will probably notice that the object you were looking at through the main telescope is not in the center of the telescope. Adjust the screw on the side of the finder telescope to bring the object in the center. You are aiming to have it simultaneously in the center of the main telescope and the finder telescope. Doing this will greatly aid finding things at night. Now that you are roughly focused, and your finder telescope is aligned, you are ready to wait until nightfall. If you can, it is best to leave your telescope outside as night falls so it cools down with the dropping air temperature; this prevents condensation (dew) forming on the optics. Once night falls, it should simply be a case of lining up the finder telescope on your target and getting it nicely centered. A good tip here is to get down low and sight along the edge of the telescope tube to line up roughly. Then it should be visible within the finder telescope or at least, very close to it. Move it to the center and hey presto! you should have the target in the field of view of the main telescope. If you have more than one eyepiece, try swapping for a higher power eyepiece. You will find the atmospheric conditions need to be pretty good for higher powered eyepieces, so there will only be a few nights where you can use the higher power, and you will have to rely on low to medium power eyepieces for the other nights. If you follow these simple steps, then I guarantee you will not only be able to find objects in the night sky but line up your telescope to get a closer look. You will be amazed at the views that even a small beginners' telescope will show you, so get out there and enjoy the cosmos.